You’re not seeing spots: it’s the beautiful polka-dot Ginger Kelly glassware from European Resources Direct. These days you can be an expert mixologist, just by opening a bottle and a tin. The same quality mixes available to bartenders at the finest establishments are available to you. Just add your own spirits, stir, pour and serve. Whether it’s an “everyday” Bloody Mary, Dirty Martini, Cosmopolitan or Mojito; a fruity Mango Margarita or Apple Martini; or a Chocolate Martini or Espressotini for “dessert”—these special mixes, rimmers, and accents will make your home-crafted cocktails as impressive as those at any prestigious watering hole. We’ve also provided some delicious cocktail recipes. Serve your cocktails in great glasses, and you’ve raised your score even higher. And don’t forget to check out the best cocktail snacks in our Hors d’Oeuvres & Cocktail Snacks section. When you’d like to take someone out for a drink to celebrate but it isn’t feasible due to scheduling or geography challenges, send him/her the fixings to enjoy one in your absence. 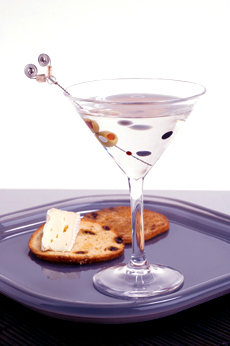 Several specialty food companies make professional-quality mixes for the classics as well as the latest cocktails—Mojitos, Apple Martinis, Mango Margaritas, Chocolate Martinis—and most include festive, flavored sugar glass rimmers as well. 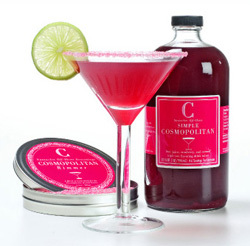 The Cosmopolitan Cocktail Mixer and Drink Rimmer from Stirrings let you make an effortless, glamorous Cosmo that would delight Carrie Bradshaw.